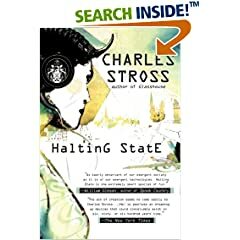 If you’re a programmer/gamer geek and looking for a gripping book that you won’t be able to put down then look no further than Halting State. I’ve been on a Stross kick for the past few months, having read Accelerando, Glass House and Iron Sunrise. Halting State is easily his most engaging book I’ve read so far. It takes place in the near future where ubiquitous computing has started to take hold via mobile phone networks. This is a future where online roleplaying games and live action roleplaying games are an international past time (as we already can see happening now with the gaming industry being a bigger industry than the movie industry). The story starts off in with a bank robbery by a band of Orcs in a virtual world — a band robbery that should not have been possible because of the digital cryptography keys involved. 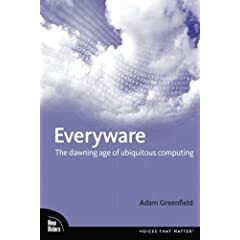 As much as I enjoy video games and fantasy settings, the book thankfully takes place mostly in the real world — although in the age of ubiquitous computing and common place augmented reality, who is to say what is real? It reminded me of War Games meets Cryptonomicon and World of Warcraft. Stross manages to get all the geeky elements right, and I’m not just saying that because my player character in my weekly table-top campaign is a were-bearbarian. I don’t want to give away any spoilers, but this is a wonderful whodunit, and if this is what Charles Stross has in store for us in the future then I’m going to have to make more room on my shelf. 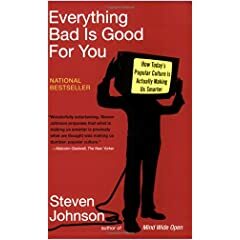 Credits to Fred for introducing me to Everything Bad is Good for You: How Pop Culture is Making Us Smarter. The thesis behind the book is simple: if you look at the popular media culture over time it is becoming more and more complex. There have always been avant garde examples that wove complex stories but over time the same techniques are used in mainstream pop culture. IE: It is becoming common place to produce tv shows and movies that require multiple watchings to fully digest. The book notes that this is in deep contrast to the old mantra of television programming where you wanted to go for the least offensive programming possible to avoid loosing market share. Johnson posits that one of the causes for change is before we didn’t have the ability to easily rewatch a tv show or movie to catch something we might have missed on first viewing. Johnson also notes that the decline in reading books isn’t as bad as many people make it out to be because we have so much more access to written content via the Internet and more importantly people are writing more than ever before. I thought this was a good counter argument; when I look at the online presence of myself and my friends most of them are doing some form of content creation instead of passive content consumption. The one area where I felt the book fell weak was in proving that more complex content is making us smarter. Intuitively I agree with the hypothesis, but the only proof offered was how IQ scores have been increasing in the average to above average segment of the population, but IQ scores haven’t been increasing for the ultra-smart people. It makes sense because the complexity of pop culture might be enough to increase problem solving skills in the average person but wouldn’t be enough to increase skills in the exceptionally above average. I recommend reading this book after reading Made to Stick because Everything Bad is Good for You is a perfect example of how to convey an idea that will stay with the reader. The only downside is that some of the pop culture examples are already getting long in the tooth and I already agreed with the hypothesis without needing that much evidence. It might make for a more interesting read if it challenged your perceptions. I don’t have anything against the for Dummies series (one of my friends is an author), but they’re only good when you want a very general understanding of a concept. I wouldn’t recommend the series for technical books. But my local library happened to have a copy of Ruby on Rails for Dummies, so I gave it a try.Here’s the good news: if you’ve ever used a programming language or used any HTML then you can skip the first 150 pages. The 26 pages of how to install the software can be skipped by using InstantRails and then downloading RadRails. You’ll want to pay attention to pages 104 to 112 where the author delves into some of the ways Ruby is different than other programming languages (blocks, yielding, symbols, 0 is true). The book uses RadRails for all of its examples; which is fine except that it takes so much longer to explain how to do something with a GUI than it does to type rails myproject or script/generate controllers ShoppingCart show. I really hate that they don’t show the one line console command as well as the four pages of GUI operations and screenshots. They don’t specifically mention which version of Rails they’re using, but the installation screenshot shows rails-1.1.2, which is a little on the old side (although the only errata I’ve seen is that require_gem doesn’t work anymore). Thankfully once you’ve skipped ahead to chapter 8 and they start dealing with Rails in all its glory the book gets a lot better. One thing that’s pretty dang neat is that the author provides his email address and his phone number. That’s an impressive level of service. He tries a little too hard to be funny in the book, but there were some parts that made me chuckle (like when he talks about sending email reminders to his wife, but using instant messaging when he needs her urgent attention). Unfortunately I’d recommend picking up a copy of Agile Web Development with Rails (AWDWR) instead of Ruby on Rails for Dummy (RORFD). RORFD is split into many small unrelated examples while AWDWR has more extensive example code that you could use as a skeleton for a professional site. AWDWR is much clearer to read than RORFD, which always interrupts the flow with a new figure and screenshot. One page of text may cross-reference up to ten other figures/screenshots/chapters. It feels like RORFD has ADD and it doesn’t make for an easily digestible read. You can find a more favorable review here. When bloggers like Gina Trapani, Mark Frauenfelder, Chris Anderson, and Phillip Lennsen are honored to be collected in New York Times’ bestselling author Michael A. Banks’ new book, Blogging Heroes: Interviews with 30 of the World’s Top Bloggers I can’t even begin to describe how exciting it is to be included in the list. “Someone must be making a mistake,” went through my head several times. If you spot any other chapters in the wild, drop me a comment on this blog post and I’ll add them to the list. Michael Banks is talking about the experience of writing Blogging Heroes. 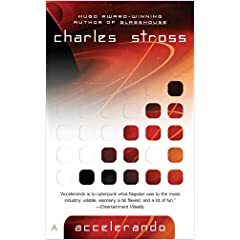 Last night I finished reading Accelerando by Charles Stross. Like many of the books I read these days, I heard about it from another blogger. It feels like a spiritual sequel to Alvin Toffler’s Future Shock, John Brunner’s the Shockwave Rider and Warren Ellis’ Transmetropolitan. It is about information overload to the nth degree and too much change in too short of a time. Accelerando is broken into 9 fragmented stories with decades passing in between them. This is too bad because it was the initial segment, only a few years in the future, that I found most interesting. Our protagonist is hooked up to a portable computing network of software agents that he uses to continually data mine and plug-in to a “river of news”. As he communicates with other people he spawns off parts of his “distributed brain” to research more information and get back to him. The greatest inventions usually come from seeing the possible connection between two separate things (eg: peanut butter and chocolate). Like in the Shockwave Rider, our protagonist is successful because of his ability to gather and process information is so far beyond an average person’s. Being immersed in the information stream he sees the connections and trends that other’s can’t see. These connections lead to so many successful ideas, that he can’t possibly execute on them himself – because the time it takes to implement them would take away from the information processing that is his true talent. He makes a career of giving away his ideas and surviving off of the reputation gain and support of his sponsors he’s made so successful. Very much like Doctorow’s concept of whuffie – reputation as currency. The book progresses to talking about the post-human experience after digitization has reached the point that we can successfully digitally encode human personalities. Post-death society, heads in jars and living bodiless on the internet. There’s a really good bit on how the next major species will be intelligent corporations and artificial spam intelligence. But what really interested me was the initial chapters so close to the beginning 21st century: how do we use technology to deal with information overload? We’re in the middle of a great revolution where anyone can become a self-publisher. But that’s the crux of the problem, isn’t it? Anyone can become a self-publisher. The low barrier to entry makes the competition for attention fierce. At some level we’re all on par with the lowliest spammers, trying to compete for other people’s attention. There is so much new content being created all the time at the only way old content stays in the public record is if the Great Google God returns it in a search result. This is only going to get worse because Google has created a new caste of blogging serfdom. People create content and splash Google ads on it with the hope of that it will do well in Google search results so they can get paid. There’s many a “business model” that relies completely on Google-Google Search for traffic and Google AdSense for revenue. And there’s an even larger amount of so-called business models that rely almost completely on Google for traffic, even if the money comes in via other means. I think you know what happens to the money when the traffic stops. I use the term “business model” above loosely, because a model that is entirely dependent on an outside company, for either traffic or revenue or both, is not really sound. You’re not in charge and you have very little control, because if Google decides to change the rules, you’re out of luck. Based on that, I would argue that relying on Google is not a business at all. I’d say you work for Google. Where are the Smart Filtering Agents? One of the things I remember clearly about the idea of intelligent agents in the early 90s was how it was going to revolutionize how we consume information. Instead of having to *gasp* pick up a newspaper, autonomous software agents would search the net finding tidbits of information what we were interested in and adapting and learning from how we interact with the results. Sci-fi books like John Varley’s Steel Beach dealt with the relationships between humans and these evolving artificial intelligences. Take a moment to glance at the Wikipedia page on software agents; it’s quite good. The 90s hope for intelligent agents has congealed. RSS has gotten us part of the way; now we can pick voices out of the chaos that we allow to push information to us. We can subscribe to alerts on search subjects that interest us. But aside from custom recommendation engines like Netflix and Last.FM there isn’t really a bot out there for finding information for us. I see the fledgling baby steps of software agents delivering news. There are several sites competing for being able to filter through a list of RSS feeds and recommend the best news items to you. There’s also the “build your own” filtering agent approach. And let’s not forget the ability to monitor search terms. One of the more enlightened concepts I’ve come across is FaveBot that wants to bring you the custom information you want about your favorite actors, authors and musicians. Is the Answer Better Gatekeepers? Is having an intelligent software agent the right approach or is it better to let humans do the filtering? The past year has seen an incredible rising in using crowdsourcing to decide what is the best information available. This is how digg, reddit, stumbleupon and the delicious popular page find interesting information by using the wisdom of mobs. Unfortunately when the user-base grows too large it becomes watered down to only common denominators. The other approach is to find human editors to act as your gatekeeper. I’m not talking about hiring your man in Mumbai, but rather niche news sites like Slashdot, BoingBoing and Fark, and to a greater extent using the network of blogs you enjoy to act as your information gate keepers. 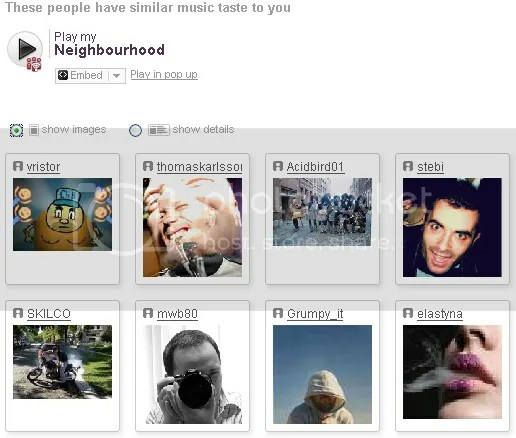 The last.FM music service is an amazing tool for finding new music to listen to. What makes it even stronger is its ability to find your “neighbours” – people you don’t know who have similar musical tastes. Listening to your neighbourhood radio is like having a friend who’s a DJ and always pushing new and interesting songs at you. I don’t know any of these people, but I like their musical tastes. Maybe instead of software agents we need software that connects us to other people who have similar interests? I read LifeHacker because I know the editors have very similar sensibilities to what I find interesting. Jon Udell shares my same love for information organization and manipulation. Jeff Atwood has perhaps one of the most engaging blogs for general geekery and love of programming, and his twitterstream is always full of interesting links. The only downside to filtering information is that restricting your input to the people you already agree with creates a reinforcing feedback loop and destroys your patience and your ability to be around people with differing outlooks. I’m going to celebrate Labour Day with the only book I’ve ever read that captured what it’s like to work at building integrated circuits. The Soul of a New Machine is a Pulitzer Prize winning book written in 1978 by a reporter named Tracy Kidder. Hat tip to Scott Rosenberg, or rather to James Fallows, for turning me on to this book by comparing it to Dreaming in Code. If you’ve read the book, you’ll probably find this interview with Wired (2000) interesting, as it catches up with the old team. Rather than pontificate on what the book meant to me, I’m going to cut and paste some quotes from another reviewer on Amazon. When it was first published, the book was a narrative of what was then `modern’ technology, where the central processing units (CPU) or `brains’ of commercial minicomputers and mainframe computers were built up on large circuit boards from individual, specialized integrated circuit chips, with each chip integrating dozens or hundreds of discrete components. This compares to today’s microcomputers where the entire CPU is placed on a single chip incorporating tens of thousands of discrete functions, all taking up no more room than the average credit card. Now, the book is more a history of how this technology was developed, and yet its picture of how people work in teams developing technological projects will probably never go out of date. The irony of this book is that the computer being developed by the team described in this book, a 32 bit Eclipse computer developed by the Data General corporation, a competitor to the larger and very successful Digital Computer Corporation (Digital), did not really achieve any major breakthrough in technology. While it was intended to compete with a new generation of Digital VAX machines, it ended up being just barely faster than VAX’s in a few special tasks. In fact, in a conversation I once had with some Digital engineers, they said that when they went head to head with Data General in bidding for a computer sale, the only thing they had to do was bring out Kidder’s book to demonstrate that the Data General box was yesterday’s news. Data General may have had the last laugh, as ailing Digital was bought out by Compaq, which has since merged with H-P, further submerging the once great Digital presence in the commercial computer world. Meanwhile, Data General is still around, albeit not the presence it once had when the `minicomputer’ was the great alternative to the IBM monoliths in the glass houses. The very word, engineer, dulled the spirit. It was something your father might be interested in. Typically, a machine gets built and sent to market and in its first year out in public a number of small, and sometimes large, defects in its design crop up and get repaired. As the years go by, the number of bugs declines, but although no flaw in a computer’s design might appear for years, defects would probably remain in it– ones so small and occurring only under such peculiar circumstances that they might never show up before the machine became obsolete or simply stopped functioning because of dust in its chips. Most computer companies have boasted that they aren’t just selling machines, they’re selling productivity. But that clearly isn’t always true. Sometimes they’re selling paper-producers that require new legions of workers to push that paper around. “It’s a long-term tiredness,” said Rasala. There is a grassroots movement to make July 11th an International Fair Use Day where we all celebrate our rights to copy content in a fair manner (i.e. : backing up software/movies, quoting other sources). Copyright laws have reached the point where they stifle innovation and prevent use from standing on the shoulders of giants. Fair use of copyright is very different from piracy; copyright laws should protect the rights of the content creator but also protect the rights of the end user. Fair use is about achieving balance between the two different interests. Copyright discussion and technology often go hand-in-hand because advances in technology make it easier and easier to cheaply reproduce what was originally hard to reproduce. Striking a balance between producers and consumers is very important. If nothing was profitable then nothing then there would be less innovation, but on the flip side what if producers held complete control over how and when their works could be used? 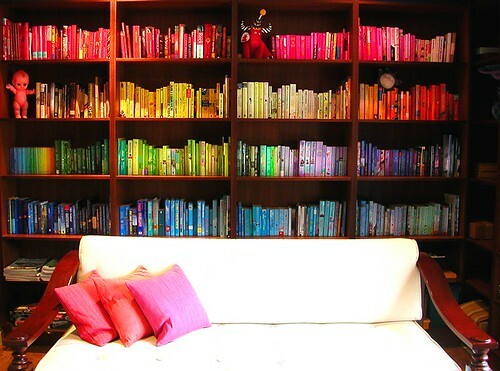 Can you imagine a world where you weren’t legally allowed to re-sell or buy used books, CDs or DVDs? Can you imagine a world without libraries? July 11th is a great choice for the date because it is also the birthday of Canada’s own digital rights super-hero Michael Geist. Happy birthday, Michael. If you aren’t familiar with his work, then I recommend starting with a series of articles called “30 Days of DRM” that are enlightening to say the least. Another Canadian digital rights super-hero is Cory Doctorow, a science-fiction author and co-editor of the famous BoingBoing weblog. 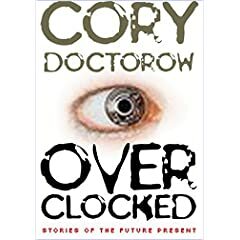 Last night I finished reading Cory Doctorow’s new collection of short stories, Overclocked, and I was very surprised at how much I enjoyed it. I’ve read two of his other books, Eastern Standard Tribe and Down and Out in the Magic Kingdom, and found them disappointing although full of interesting ideas. Overclocked succeeds where the others failed for me because the short narrative allows for a focus on the ideas without feeling that the characters are neglected. Cory deals with information warfare, robotic sentience, inequalities between first and third world countries and the next level of copyright infringement – when we have 3d printers that can replicate any goods. So much of our current consumer laws are based on the concept of scarcity. We’ve already entered a post-scarcity economy when it comes to entertainment goods that can be reproduced digitally. 3D printing already exists, what kind of world do we want to live in when anything — even food, clothing and electronics — can be reproduced with minimum cost and effort? All of the short stories in Overclocked are already freely available online from other sources. You can check them out by following these links. Printcrime – the real outcome of a society where copying has been made illegal. When Sysadmins Ruled the Earth – when a biological agent wipes out humanity the only people left standing are the sysadmins who were protecting the network in clean rooms. Anda’s Game – a young girl learns about goldfarming and world wide inequality thanks to World of Warcraft. I, Robot – Asimov meets Orwell in a mash-up of 1984 and I, Robot where government controlled restrictions on technology have created wars with countries that don’t follow the same restrictions. I, Row-Boat – a sentient row boat with free will explores the nature of consciousness in a post-human society. After the Siege – A city goes from utopia to a cesspool of human misery when other countries attack them for illegally copying the goods they need to survive. I heard about Programmers at Work in the blog buzz surrounding the release of Founders at Work. 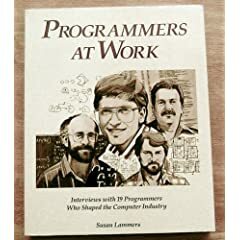 Programmers at Work is a 20 year old book (1985) that interviews some of the top programmers of that era about the art of programming. It is not widely in print anymore, but it was easy to find a copy at my local library. When I picked it up at the library I wondered how relevant would it still be? The only constant with technology is how fast it changes. Coding Horror has a post asking people what their favorite programming quotations are. He throws a sideways reference to Programmers at Work, a book I recently finished reading. I’m one of those annoying people who writes in the margins of books, and one of the things I like to do is collect my favorite quotations so that I can remember them down the road. These are my favorite quotes from Programmers at Work: Interviews with 19 Programmers Who Shaped the Computer Industry. It is a collection of interviews Susan Lammers did in the early 80s. You can read my full review of the book here. Cory Doctorow is a writer from Toronto. He is well-known for being co-author of one of the most popular blogs on the planet (BoingBoing), his association with the Electronic Frontier Foundation and for his stance against copyright. 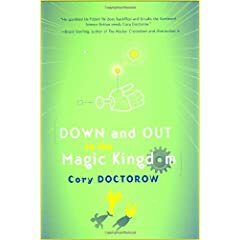 Down and Out in the Magic Kingdom was his first novel and one of the first books to be simultaneously released in published form and as an online free download. 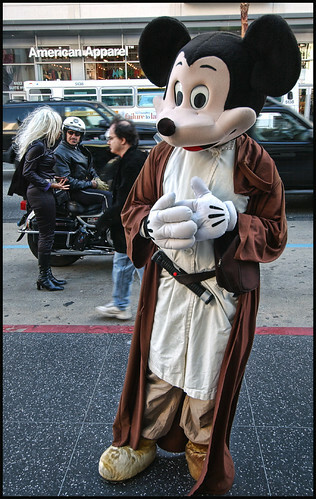 While I could have done without the focus on Disneyland, there were several key ideas in his book I found interesting. The story takes place in a “post-death” society. Scientists have discovered how to “back-up / brain dump” the human brain so that all the experiences that make up a person can be copied into a new body — which are easily available thanks to cloning advancements. Death becomes meaningless as you only lose the time since the last back-up (days or weeks). As would be expected, medicine takes a complete nosedive; why try to heal a body when it is so much easier to grow a new one? Everyone is online all the time with a “heads up display / HUD” that provides them additional information about the things around them. In this post-scarcity economy where material goods are abundantly available currency has been replaced by “whuffie” — a quantitative measure of how you are viewed by society. Think of something like micropayments where if you write a popular song people can give you a small portion of their whuffie and the riches come from reaching many people. “Whuffie recaptured the true essence of money: in the old days, if you were broke but respected, you wouldn’t starve; contrariwise, if you were rich and hated, no sum could buy you security and peace. By measuring the thing that money really represented – your personal capital with your friends and neighbors – you more accurately gauged your success”. Whuffie is a measure of reputation, and as a blogger I saw this as a natural offshoot of the blogging microcosm. Whuffie is like attention.You write good content to get hits, links and to increase your influence. Linking to someone is like giving them whuffie. Having a high Wuffie score gets you exclusive invitations, free stuff and a general level of respect. Whuffie promotes a society where people perform actions to make them more popular. This is where the focus on Disneyland takes place. The book is about in-fighting between several of the factions who control the rides. I felt pretty “meh” about all of the Disney stuff but I really enjoyed the concepts of this futuristic society and I’d recommend the book for that alone. Write what you know. In this case, what I know about is being a geek. Over the next few days I’ll be suggesting things that I liked. I’ll be giving ball-park prices (in Canadian dollars) and at the end of each post I’ll include a link to where you can find all of the items on Amazon. This time around I cover some of my favorite novels. Unlike the rest of the posts in these series, I haven’t read most of these books. I’m basing the recommendations on the countless other lists on other tech websites, particularly Jeff Atwood at Coding Horror. These books are programming language independent and would make a great gift for anyone working in high tech. Jpod is the sequel (in spirit) to Microserfs. The mid-nineties fast forwards to the mid-naughts and our protagonists switch from being monolithic Microsoft serfs in Seattle to serfs for a large game company in Vancouver. The title is a clever marketing ploy; it has nothing to do with Apple/iPod. JPod refers to the cubicle the six protagonists share. The tagline used in the marketing campaign is “Generation X-Box,” another blatant product alignment to sell more books. 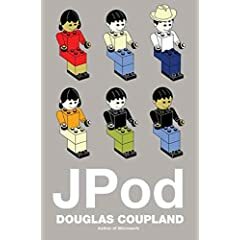 Is JPod proof that Coupland has sold out? This is a list of my favorite quotes and quotations from JPod by Douglas Coupland. There’s something very appropriate about reading Microserfs when you’re working at a startup and it is crunch time. The year is 1993 and this is the story of Daniel, a software tester at Microsoft. He lives in a geek house with his co-workers, and his relationship with them and their relationship with the software industry is the backdrop for this slice of life. It is typical Coupland fashion, strong on narrative/characters/themes and weak on plot. Microserfs started out as a short story for Wired magazine and the original texts can be found here and here. It is an epistolary novel written in first person as Daniel types in his personal diary on his laptop. Flashbacks abound as we hearken back to a pre-Internet explosion era when Multimedia was the rage and everything had to be on CD-ROM. It is striking to look back and see how obvious it was to use computers for writing personal journals. Blogging is a natural evolution. (Or as Mil Millington likes to put it “nerds talking to themselves in public”). After the break, more of my review of Microserfs. joelonsoftware is one of the highest read programming blogs because Joel Spolsky does an excellent job of combining technical information with humour that makes his writing informative yet interesting. 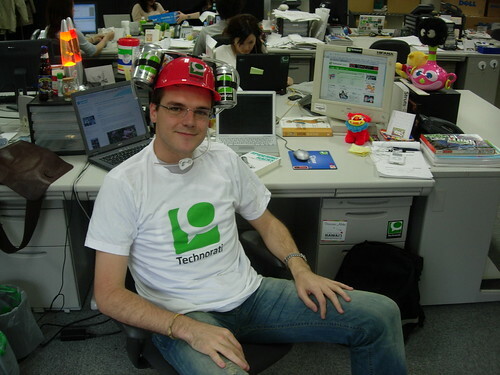 He was the program manager for the Microsoft Excel team and has since moved on to running his own startup. His books collects some of the best articles from his website. It’s broken into four parts, the first three of which I think are essential reading and the last of which is a comentary on Microsoft .NET which seems really unnecessary and probably won’t age as well as the rest of the book will.The book is unusual for any kind of tech book is that it’s a real page turner. Unfortunately, most of the content is already from his website so I found that for the first 70 pages or so I was just rehashing some of the best articles on there. If you’re already a regular reader of his site you might not get nearly as much out of it as someone who is picking it up fresh. Joel’s approach to many things is so simple that even experienced programmers can find some useful nuggets of information in there (although there is strong focus on Microsoft products). I really wish someone had taken me aside with his advice on painful schedules when I’d first started. It is amazing how doing minimal time tracking every day can make you better at estimation and better at realizing where you are spending your time and focus. After reading Paul Coelho’s the Alchemist, I thought this would be a fantastic follow up. Unfortunately, I was wrong. Where the Alchemist was a very focused tale examining a specific theme of following your dreams, TAoHaW was more of a diatribe between two people exploring a subject without a clear hypothesis. I think there is some good wisdom in this book, but so much of it is common sense that you already know. One very interesting distinction is where the Alchemist encourages you to follow your dreams no matter what the cost, TAoHaW suggests that happiness comes from within, from accepting your circumstances and making the most out of them (although it is important to recognize when a work environment is bad). I really wasn’t impressed with Howard Cutler (the author of the book). His writing style was very vague, and it seemed to be filled more with his own explorations and thought process without any real conclusions. Some of the facts and statistics he spouts seem a bit shoddy as well (but then again I’m part of the “all statistics are lies camp). A friend from work recommended that I pick this up, and I was glad I did. This is one of those novels that everyone should read when they are at a crossroads in their life and wondering what kind of career path they should pursue. It is the tale of a young boy who decides to listen to his heart and follow his dreams instead of succumbing to life of mere contentment. Throughout this allegory, Coelho imparts the wisdom that as long as you are following your heart and your intuition, and you listen to the omens that life provides, you will find success in that which you most desire. It is one of those books that is simple yet profound and everyone should read at some point or another.